A rifle should shoot well from a variety of positions, maintaining same point of impact despite differences in technique from shot to shot. The concept of the "forgiving bow" is well known in archery but I haven't seen it applied in rifle shooting. I have a springer air rifle, very expensive and top of the range. I wouldn't like to admit its less than accurate but I just can't shoot consistently well with it. On the other hand, I have a 7mmo8 which shoots to the same zero from sandbag, bench, prone on a front rest or a bipod. Whether I'm prone unsupported, draped over a rock or backpack, sitting rested across a branch, or waving around standing at a post, if the cross hair is on the target when it fires, the bullet will hit it. How do you design a gun like that ? Stock design for good recoil. I have no idea what geometry is needed for this. Good cheek weld for eye position to scope. Also, parallax adjustment in the scope. General stock fit to the individual shooter. Heavy weight. I'm not sure if this is essential or not. Related is moment of inertia; That airgun weighs over 4kg but its short and has no barrel to speak of. Bedding ? Is there something that makes it stable whether the stock is held tight or free recoil or stressed by a bipod ? Would ali pillar/frame or carbon fibre be better than bare wood or plastic ? with your springer hold the forend really firmly and your results will improove....well thats what worked for me anyway. in short you got to know when to hold em .......yeah some guys do fold em. gadgetman and nevereadyfreddy like this. Some research about artillery hold and a little practice well its all good now. Very true. 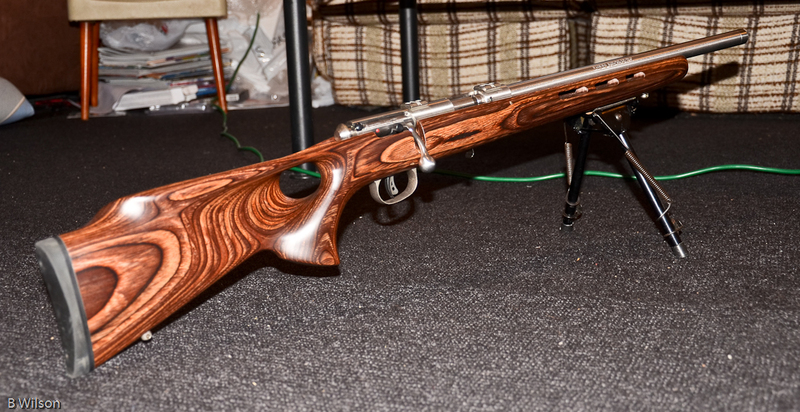 The Spring airgun and compound bow are Classics of twitchiness and volumes have been written on perfecting technique to get good results from them. I'm thinking at the moment about powder burners and how a builder would make them to perform well with average shooter technique in the field as well as on the flat range or bench. Learning from the airgun example we could add short lock time and possibly minimal internal moving parts as making it easier for the shooter. I'm thinking that a narrower pistol grip might be more tolerant of variation in trigger hand position. A palm swell feels nice (but only if its in just the right spot compared with how long your finger is). But you need to get your hand in just the right location over it. If you're in a hurry or the position is unusual (eg elbow tucked up close to your body) then with a thinner grip your hand can move around without putting a new strange pressure on the stock. Or maybe the palm swell definitely locates your hand so the trigger finger always reaches the same distance onto the trigger at the same angle and doesn't drift over to drag on the wood. Option B for me I think - using my Savage Mk2 BTVS as an example, the sculpted shape and ergonomics of the thumbhole stock seems to put my trigger hand into the same position every time and result in more consistent shooting (from a variety of positions) than I've had from a skinny grip synthetic version of the same rifle, even though its capable of groups just as tight when all the variables are controlled well enough. Weight, balance then stock shape and length for me. Scrunching myself up behind my little Kimber is fine for quick off hand shooting but not prone, whereas Tobys' model 70 here has plenty of weight and a decent LOP and can be shot well from any position. Bagheera and Gibo like this. Consistency is everything, a rifle moves about 1.6mm minimum before the bullet leaves the barrel (as per the laws of physics) so if you don't have consistency and follow through even in the most controlled conditions e.g. at the bench, your groups will suffer, and in the field its even more important. Ah thanks for that figure, a couple of mm sounds about right. Do you think it would be an advantage then to have a recoil pad that compressed by that amount so the rifle moves straight back at first, compared to one that's hard plastic where small differences in shoulder hardness / pressure would affect the jump more ? GravelBen, does your thumbhole stock have much of a palm swell or is it a thin cylindrical pistol like grip inside ? A lot of tactical rifles have something like a vertical bike handlebar for your trigger hand - not sure if that's good or not. The palm swell is fairly big, there is basically only one comfortable hand position. Couple of old photos to give you an idea of the shape, pretty sure you wouldn't call it tactical style! Forgiving in what sense/context? If I'm on a multi-day trip, living out of my backpack, then I'd be more inclined to lean towards a rifle which is forgiving in weight...but that in turn may mean there needs to be a compromise in other area(s). So a forgiving mountain rifle may be different to a forgiving target rifle or a forgiving safari rifle? Archery is no different. If utmost accuracy in a competition setting is your aim, then features such as length and weight can be explored freely without too much effect on practicality or comfort. Hunting in tight brush, however, or out of a blind, then you may opt for a shorter axle to axle bow - because a decrease in balance in favor of better maneuverability may provide a more forgiving bow in that specific situation. Last edited by Frodo; 22-09-2017 at 01:22 AM. Sort of renders my response irrelevant. gadgetman and GravelBen like this.